would be part of the Wall-E sculpture by Ice Breakers. to construct a Wall-E themed ice sculpture during Frost Fest. a water bottle and some perseverance. 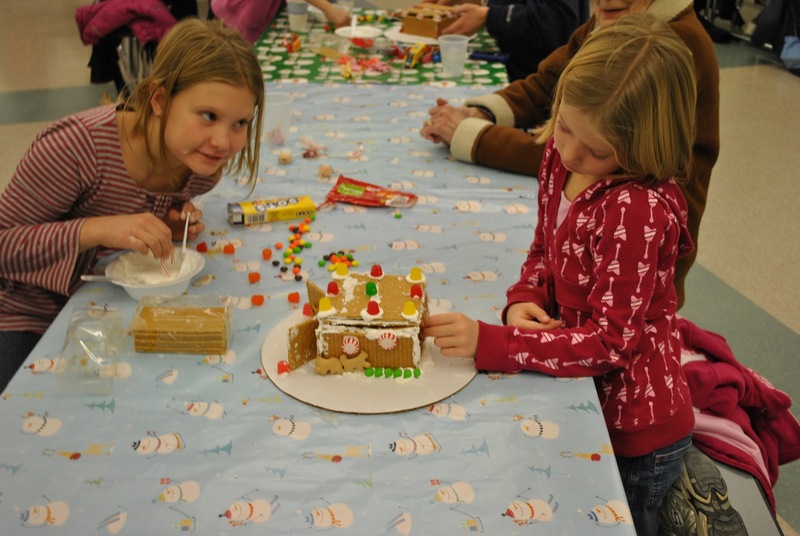 to the masses for fun events, like Derry's annual Frost Fest. which he then uses to mold, shape and "glue" together ice blocks. Eighteen-year-old Rob Thomas of Derry (pictured below) donated his first pint of blood on Friday at the Derry Police Department’s winter blood drive. “I like to help people and always wanted to give blood, but I was too nervous,” Thomas said shortly after giving blood. “Today I worked up the nerve and had a friend come with me for support.” Derry’s annual blood drive is the fourth largest in the state and 60th nationwide. The event regularly draws more than 400 people to donate, said Paul Bergeron, blood services representative for the American Red Cross. Bergeron presented Derry police Chief Ed Garone with a plaque to acknowledge the department’s more than 30-year commitment to the drive. “We recognize what they’ve done for us,” Bergeron said. “They are extremely busy and the community of Derry has grown a lot, but they are still willing to help us.” Derry police officers Joyce Chadwell and Dan Komenda spent many months leading up to the Friday drive organizing volunteers and securing food donations from area restaurants. “We’re just helping out, and the great thing is that so many people are willing to give, too,” Chadwell said Friday. DEFYING GRAVITY A pair of apples refuse to let go of a gnarled tree at Mack’s Apples on Mammoth Road in Londonderry. Nov. 1, 2010: A longtime ritual was revived when someone anonymously scaled the 30-foot-tall Grand Army of the Republic statue outside First Parish Church on East Derry Road in Derry, and planted a jack-o-lantern on its head. Although it was a common Halloween prank decades ago, no one knows who has revived the phantom pumpkin head or why. Sept. 27, 2010 Circle of Life: A circle of sunflowers at Sunpoint Farm on Old Chester Road seem to bow their heads to the waning morning sun, nature’s way of allowing the seeds to drop into the earth and regenerate. 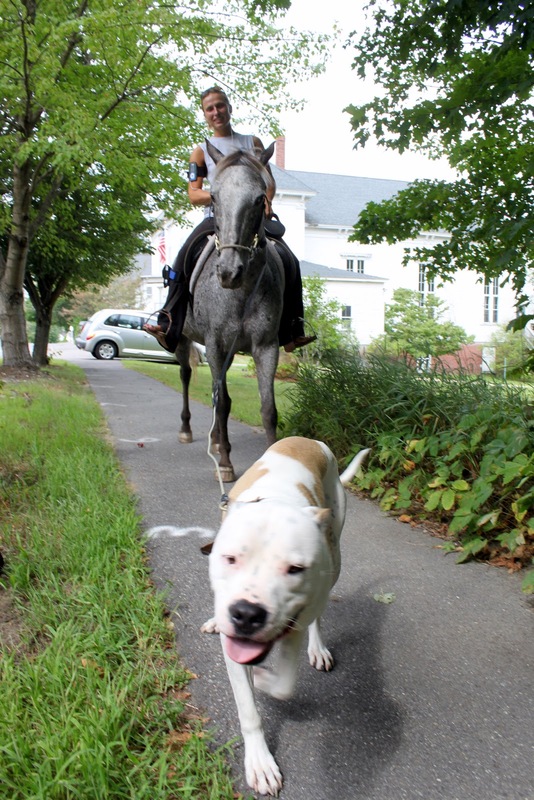 Aug. 13, 2010: Tiffany Magnan hits the urban trail, riding her 20-year-old Leopard Appaloosa, Harriet, who is led along East Derry Road by 2-year-old American Bulldog Elroy. Harriet has trained many dogs how to navigate the 3.6-mile loop through East Derry, said Magnan, who lives along Beaver Lake. JUNE 25, 2010: RAISING THE FLAG FOR 'CURLY' GANNON: Charlie Evans, right, hoists a flag on the newly installed flagpole, installed June 14, dedicated yesterday to his father-in-law, Robert “Curly” Gannon, a long-time Rotarian and World War II hero. Yesterday’s brief ceremony took place at the corner of Broadway and Mannon Street in the town’s Pocket Park. Police Chief Ed Garone, left, assisted the Rotary in preparing the memorial flagpole site. APRIL 26, 2010: MAGNOLIA MAGNIFICENCE: An explosion of pink petals on this magnolia tree along East Derry Road, eye candy for passing motorists. APRIL 1, 2010: WE KNOW HOW IT FEELS. A submerged figurine seems to speak for all of us who have been dodging puddles and fighting floodwaters lately. 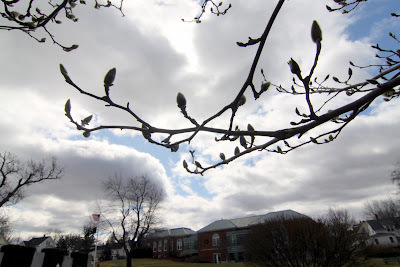 MARCH 25, 2010: SPRING IS TRYING TO BLOOM: Trees in MacGregor Park are trying to bloom despite a drop in temperatures this week. 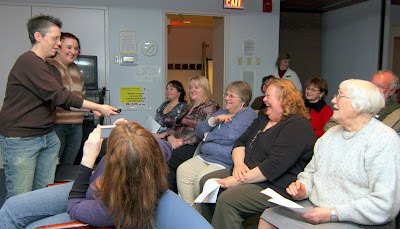 FEB: 25, 2010: GHOST BUSTERS: Ghost hunter Katie Boyd, left, holds a "ghost box" that allegedly works with radio waves to help spirits communicate, while librarian Adele Boeske, seated second from right, laughs after trying to conjure the spirit of "Mr. MacGregor," namesake of MacGregor Park, during a lecture Thursday night at the Derry Public Library on ghost hunting in New England. The lecture, which drew about 75 library patrons, was presented by Boyd and her associate, Bekah Boyd (no relation), of the Manchester-based Ghost Quest Paranormal Research Society. 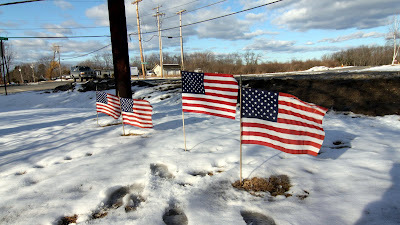 FEB. 19, 2010 FLAG DAY: Yesterday's spotlight sunshine and steady breeze provided just the right backdrop for this patriotic display outside of Linear & Metric Co. on Harvey Road in Londonderry. Feb. 11, 2010: HORSING AROUND: Windham Veterinarian Tim Butterfield, of Derry, was out for a spin during yesterday's snow with two of his wagon team, Adam, left, and 3-year-old Rio, currently in road training. 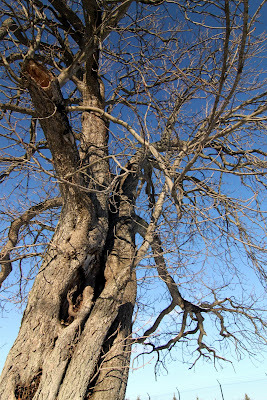 Feb. 10, 2010: SILENT SENTINELl: This stately tree looms large along Harvey Road, near the U.S. Army & Air Force Exchange in Londonderry. 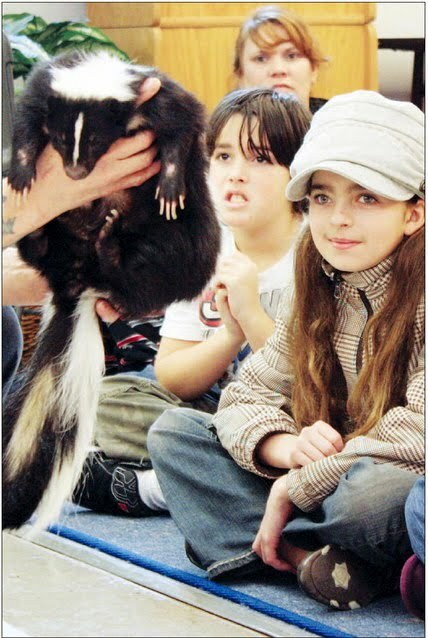 Feb. 9, 2010: Brian Pellerin, second from right, of Freedom Renewable Energy in Derry, talks with a group of West Running Brook Middle School 8th graders about how wind, solar, and geothermal renewable energy could fit into future career paths. The presentation was part of Career Course, an ongoing program at the school which introduces students to different careers. 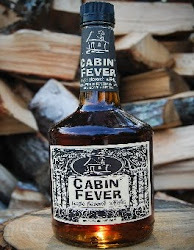 Feb. 8, 2010: Two boys find a fun way to relax and enjoy the ice on a lazy Sunday evening on Beaver Lake, taking turns pushing one another across the frozen drink in a chair. 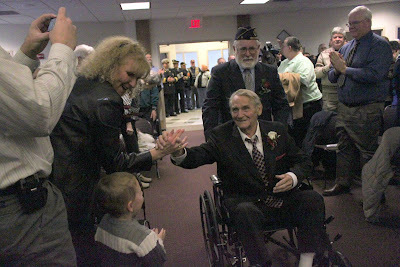 Feb. 4, 2010: WWII hero Walter Borowski, enters the Municipal Building meeting hall, greeted by a standing-room only crowd, gathered to see him receive the French Legion of Honor medal.